Enjoy a salad that’s truly guilt-free with this Vegan Italian Dressing. You’ll skip out on a ton of calories & fat while keeping that classic zesty flavor we all love. This creamy dressing is gluten-free, oil-free & dairy-free. I love having hearty soups this time of year and I also love to pair them with a healthy salad. 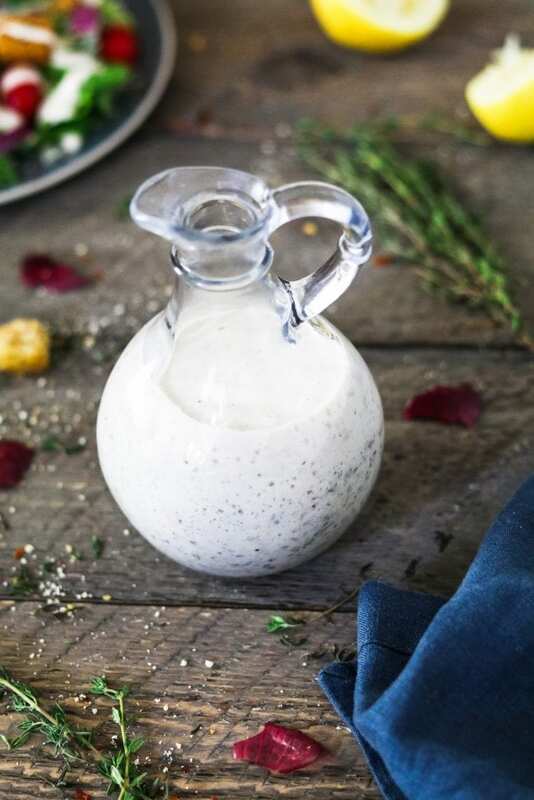 Especially, with this rich and creamy Vegan Italian Dressing. Oh, and of course a piece of fresh crunchy bread on the side. There’s just nothing better! My family is on board with the goodness, and they love soup & salad night. It’s the easiest meal to put together and it’s so satisfying and healthy, too. Tonight I’m making a batch our favorite Creamy Potato Leek Soup with a huge veggie-packed salad. There will be a bunch of happy campers at the dinner table. I’ve mentioned in previous posts, that my diet is not oil-free and I’m not anti-oil at all. I do try to limit it when possible to reduce my fat consumption. Most dressings call for a ton of oil, and all that fat seems so unnecessary to me. Especially, because I’m a little heavy-handed and don’t want to worry about how much fat I drowned my healthy salad in. Also, I don’t like the heavy feeling I get from it either. So, that’s why I created this oil-free Vegan Italian Dressing. It’s flavor-packed, rich, creamy and just good for you! 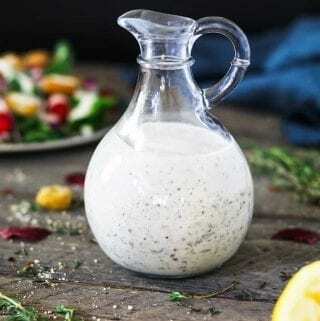 Instead of oil, I made this dressing with unsweetened dairy-free yogurt. It doesn’t provide the same richness that oil does, but it’s pretty darn close, in my opinion. I also added some raw cashews for an extra rich and creamy texture. The flavors are similar to a classic Italian dressing. I used red wine vinegar, fresh lemon juice, Italian seasoning, plus a hint of garlic and onion powder. I spruced it up with some nooch (a.k.a nutritional yeast) too, for a hint of cheesy flavor. You can leave it out or replace it with store-bought vegan parmesan cheese. I used dried herbs to make life easy, but feel free to use fresh if you have them. 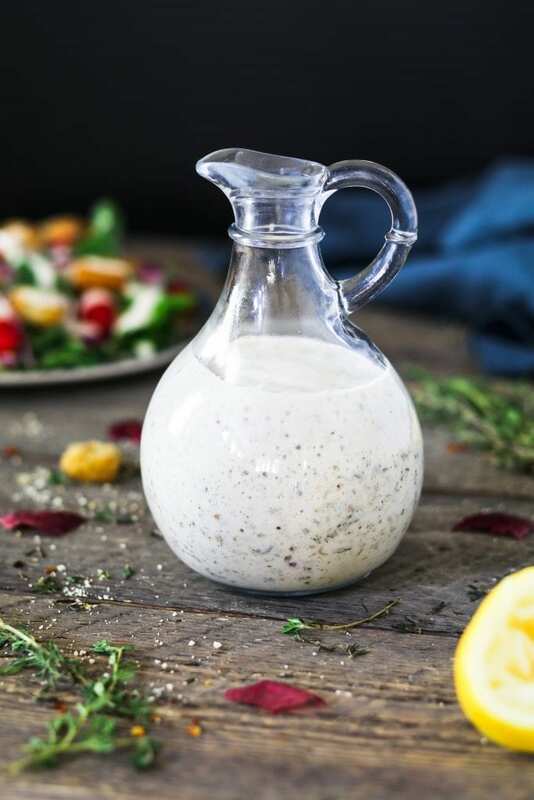 If you make this Vegan Italian Dressing, I’d love to hear what you think in the comment section below. It would really make my day. You can also follow me on Instagram and share your creation with me. Just tag me @veganhuggs and hashtag #veganhuggs so I don’t miss it. Enjoy a salad that's truly guilt-free with this Vegan Italian Dressing. You'll skip out on a ton of calories & fat while keeping that classic zesty flavor we all love. This creamy dressing is gluten-free, oil-free & dairy-free. Rinse cashews and discard soaking water. Place in blender, along with the rest of the ingredients (except for 1 teaspoon of Italian seasoning). Blend on high for 2-3 minutes, until creamy and smooth. Scrape down sides as needed. Taste for seasoning and add as needed (*the dressing will appear thin, but it will thicken up as it chills). Transfer to a small container with a lid. Stir in the remaining Italian seasoning. Cover and chill for 30-60 minutes. Give it a good stir before serving. If it's too thick (after stirring) add a few teaspoons of water and combine. Store in fridge for 3-4 days. * To soften cashew faster: In a small pot, boil water and remove from heat. Add cashews and cover for 15-20 minutes, until softened. * Yields about 1 1/2 cups of dressing. I made this just now using 1 tiny scoop of powdered Stevia instead of Maple Syrup and 1/4 C silken tofu instead of the vegan yogurt and it is DELICIOUS!! Thank you for this recipe!! Even my non-vegan family likes it! I made this just now using 1 tiny scoop of powdered Stevia and it is DELICIOUS!! Thank you for this recipe!! Even my non-vegan family likes it! Oh my, so very good! The Italian seasoning gives a wonderful snap. I made a yummy salad that included sprouts I had made. This salad dressing was dribbled over…. perfection! Thank YOU, Melissa! Hi Elizabeth, I haven’t tried freezing it yet because we go through it so quickly. It may last longer in the fridge, but I never get that far. I think up to a week would probably be good. Sorry I couldn’t be more help. You can try cutting the recipe in half too. What a fascinating recipe! 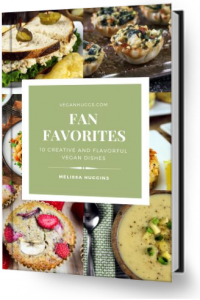 I can’t wait to try it – looks and sounds so creamy and delicious!